No technology contracts bigger than £100m. Bye-bye proprietary software monopolies–hello Open alternatives. An avalanche of government data to generate new business opportunities and pump billions into the economy. Fast broadband for (almost) all. Agility, everywhere–no more risk-averse, unchangeable systems–instead, a commitment to diversity and experimentation. Reskilling in-house tech teams, reducing dependence on external suppliers with vested interests. And after years of false dawns, services actually joined up around–and designed for–their users. There’s not a lot not to like, really. Is there? Just before the election we heard a torrent of such promises. Watching the gathered geeks and entrepreneurs around me at the launch of the Conservative Technology Manifesto last March I could see tongues virtually hanging out. 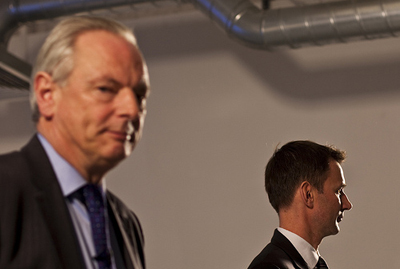 We weren’t just being offered the keys to the sweetshop–Francis Maude and Jeremy Hunt were pretty much proposing ripping its doors off. How much of these sweeties have actually been delivered post-election is a story for another day (ah, the shackles of that Coalition Agreement, I’m sure…). But over recent weeks and months we’ve seen glimpses of another what’s-not-to-like initiative. And now it’s been launched. Well, not so much of the picky, really–just an interest in shining a light into some of the corners of this debate. Because corners and angles there most certainly are. The first thing to get to grips with is that there seem to be two big agendas wrapped up together here. Both can be connected to the words “me” and “data”. But they seem to be quite different in their nature and purpose. That’s always a recipe for confusion if not properly unpacked. So let’s see what we have. We have a consumer empowerment angle here, clearly. “Giving people back their data” is billed as putting the customer back in control when forming or reviewing a relationship with a vendor. For some services, especially things like utilities and telecomms, the case is very tangibly made. We generate a lot of data in consuming the service. Understanding our consumption patterns in detail would help us when making future choices about service provider, as we’d be able to match the terms that were on offer with what we actually needed. This also extends to things like preference data: as we go about buying things (and even just looking at them) we generate a cloud of information about our preferences, choices, needs and their timing. This has a value–how much, nobody really knows, though there are some florid estimates–to marketeers, and could drive better deals and more targeted, less intrusive advertising. The moment we started to move transactions away from being with someone you knew personally in your village, we increased the complexity of how you prove things: who you are, can you pay, entitlement-by-residence and so on. Online, it’s pretty horrible, and attempts at building something that’s simultaneously secure and usable by normal people have foundered. Suffice to say that the current approach (which actually looks pretty promising) is that of “federated identity assurance”. Not trying to create one massive database of people information against which things can be checked, but to use information sourced from a number of existing trusted relationships, in combination, to give sufficient assurance of identity. Which means that both these agendas are the same, doesn’t it? They both involve consumers getting their hands on personal data that’s previously been locked up in companies. Well, actually, I don’t think it does. A definition of “personal data” is harder to pin down than might seem initially apparent [more here]. Lots of things that don’t look that personal by themselves (points on a map, equipment serial numbers etc.) take on a whole new power when linked to an individual. There’s the obvious “personal facts” stuff, of course: name, address, account number etc. which usually (but not always) identify an individual. Then there’s operational data, made much of by midata: what we’ve used, what we’re interested in, what service choices we made etc. Releasing structured chunks of this latter type could well meet Agenda 1’s objectives. And there are design choices to be made here which will have a big impact on risk and privacy. Would it be sufficient to get a log of mobile calls by time band and number type, for example, rather than a detailed list of numbers actually called, and precisely when they were made? The former could well be enough to allow a better contract to be found: the latter would be a potential privacy nightmare, not just for the caller, but also whom they called, if it were mislaid. My point being that meeting a consumer empowerment agenda requires the “giving back” of information with certain characteristics–i.e. tailored to fit the way that consumer services are packaged. But the giving back of information to help confirm an identity relationship–Agenda 2–seems to me to be a very different beast. Because I thought the whole concept of using a number of different identity providers was that you asked them to pass confirmations of trust around–not the actual personal data itself? So one might ask a bank to confirm electronically that some submitted data matched a record that they held, but that’s not the same as handing the requestor (or indeed the individual) chunks of personal data. So I fear that in an attempt “not to go into too much detail” we’ve got a conflation of two separate, interesting, important issues under the midata flag. One can always argue that “it’s the principle that counts–we should establish that first, then let the clever people get on with the solutions”. Well, yes. Ok.
We did that with electronic patient records, with Post Office smartcards, with national identity cards and registers… At some point we do need a public airing of the underlying principles in a greater level of detail than the initial press release. And before a major delivery programme has been commissioned, I’d suggest. Other than this “issue overlap” there are a few other points that strike me about midata. There is this underlying sentiment that consumers have a right to “their data”. But what is it that actually makes a particular piece of data “theirs”? Information about usage is a hybrid of personal facts (e.g. who is the account holder?) and operational information as a consequence of service use. How far does it extend? Basic consumption patterns? Probably yes. Detailed, time-stamped records of every purchase and all parties involved? Hmm. Maybe. Serial numbers and last maintenance dates of the precise routers and masts that were used to deliver a phone call? Well, now you’re being silly, Paul. Yes, I am, of course. But I’m trying to illustrate that the translation of this “right to data” into reality involves more than just signing a memorandum of understanding. Update: there’s a more detailed post about “Whose data is it anyway?” here now. And then there’s the cost angle. Even if we assume that the addition of a simple bit of code will suddenly enable service providers to spit out raw chunks of data onto the Internet (aka the “it can’t be that hard to get their systems to…” fallacy argument) the midata announcement is already talking about a greater degree of sophistication: particularly the bit about “access, retrieve and store their data securely”. Who’s going to pay for that? And do we have robust evidence that there is interest and demand for this type of data release, other than from the vociferous lobbyists with their eyes on constructing a wealth of new “personal data store” opportunities? It’s great to see entrepreneurial spirit flourishing, but how much is this about solving real consumer problems, and how much about playing yet more variations on the “consumer as product” theme–you tell us about your interests, and we’ll give you better deals (but only as a share of what we’re really making by selling that information to other vendors). That’s a bit like imagining a set of doors with fantastically complicated locks, and giving people the right to have equally complicated keys cut–rather than pushing for simpler locks in the first place. So, a lot of questions remain. Conceptually, midata isn’t something that could or should be objected to. And this post is not written to criticise, but to suggest a few areas that need more detail and analysis. When we see press releases that let fly with cool talk of data, empowerment and choice we should be getting a lot more eager to ask the next level of questions. What does this really mean? How will it work in practice? And what might some of the broader economic, competitive, social and privacy implications be? Until we do, we’ll be dazzled by press releases and then a bit disappointed when delivery swings into action. And it’s usually too late by then to do much about it.